Composed by Gabriel Faure (1845-1924). Edited by Christophe Grabowski. This edition: urtext edition. Stapled. Barenreiter Urtext. Performance score, anthology. Baerenreiter Verlag #BA10843. Published by Baerenreiter Verlag (BA.BA10843). ISBN 9790006542505. 32.5 x 25.5 cm inches. Text Language: French/English/German. Preface: Christophe Grabowski. 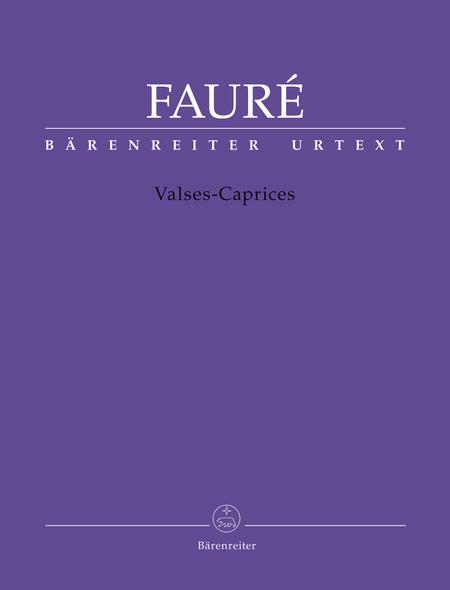 Faure's fourValses-Caprices(1882/83-1894) demonstrate various forms of his treatment of the waltz in combination with the free form of the caprice. The composer drew his inspiration for hisValses-Capricesin the first place from works such as Liszt'sValse-Impromptuand hisValse a capriccioand the famousValse-Capriceby Anton Rubinstein. 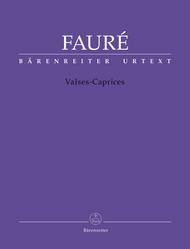 These important groups of works are now made available in scholarly-critical Urtext editions based on theOEuvres completes de Gabriel Faureand reflect the latest state of research. Detailed forewords offer information on the genesis and significance of the compositions as well as valuable suggestions on historical interpretation. All the available manuscript and printed sources as well as piano rolls containing recordings by the composer have been taken into consideration, leading to new discoveries particularly regarding theValses-Caprices.